I have always loved macaroni and cheese. It is one of my favorite foods. Lately, I've been making a vintage version from a recipe card I found in my Granny Besse's recipe collection. It's from 1973, McCall. It's a creamy, cheesy version. Because there's nothing more disappointing than macaroni and cheese that is dry - or that has no flavor. Preheat oven to 375*. Cook macaroni as directed on package, drain. Melt butter in medium saucepan. Remove from heat. Stir in flour, salt, and pepper until smooth. Gradually stir in milk. Bring to boil, stirring. Reduce heat and simmer mixture 1 minute. Remove from heat. Stir in 1 1/2 cups cheese and the macaroni. Pour into 1 1/2 quart casserole. Arrange tomato slices on top. Sprinkle remaining cheese on top. Bake 15 minutes, or until cheese is golden brown. I suspect you could double this recipe for a potluck, although I haven't tried it. How about you, readers? Are you a macaroni and cheese fan? I would leave the tomato out in the summer as if you weren't careful, it would start tasting like a hamburger helper type of thing. What you ended up with is probably just what the boys want! Linlin used colby cheese in her macncheese and she always stuck bug hunks of cheese down in the mixture before she baked it. That's why you could get a long string of cheese when you scooped out a spoonful. I wonder if you did this to this recipe, would it taste like Linlin's? I like it but the Great Scot LOVES it, I'll have to give this recipe a try! Oh yes, isnt it a staple? lol comfort food? Love Mac and Cheese. My son and I love mac and cheese. My husband isn't a big fan. Maybe this recipe could win him over. You bet I am a mac'n cheese fan! Some of those old recipes are simply the best ;) I have something similar but add condensed cream of mushroom soup instead of the flour..will have to try yours since not everyone in my world is a fan of those little mushrooms. 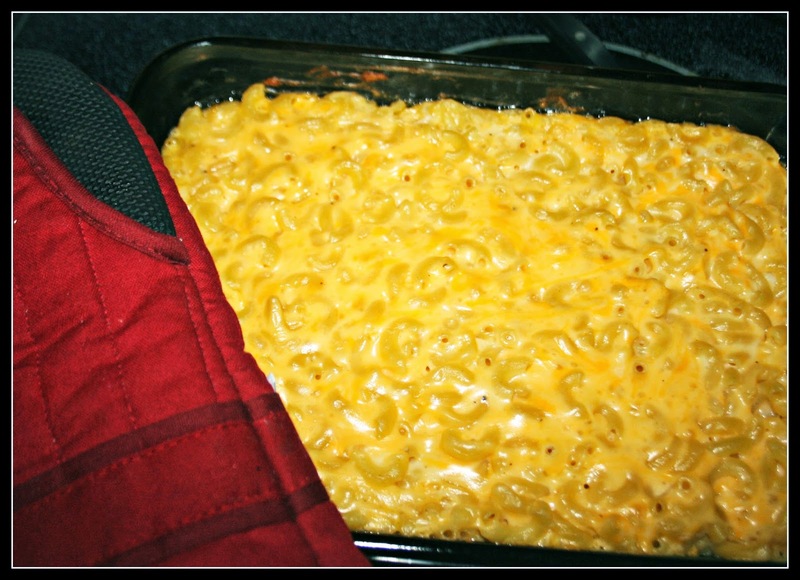 I love mac and cheese and thank you for sharing this vintage recipe! This looks just the thing for a winter's day! (It is flurrying here now so warming mac & cheese would be especially lovely:) Thanks for sharing! Thanks for sharing the Recipe. I always end up making stove top, but have always wanted to try baked. Oh, yes, mac and cheese is a big favorite! This looks yummy--so juicy and cheesy. Great for a day like today. Now that is Mac and cheese the way it was meant to be. I would leave off the tomato though. Maybe some toasted bread crumbs on top? Everything is better with more bacon! Thanks for sharing the recipe! I don't make the box kind because there is something about powder cheese that makes me feel icky. Mmmmm....the mother of all comfort foods. Love mac and cheese! Looks delicious. Nothing says "home" on a cold winter day like a plate of homemade mac & cheese. Looks so good! Mac & cheese is such a nice comfort food. Dairy tends to upset my stomach in large quantities though so I haven't had cheesy pasta in forever! Wow!! Does that ever sound sooo good! We love mac n cheese,, but never had it like this. I haven't had mac and cheese in a long time! It looks so good! I don't eat too many carbs….but when I do, I like it to be 'worth' it. THIS looks delish. Thank you for sharing….I'll try it soon. Hubby has decided he is allergic to dairy. I've changed all my menus. I'm so sad! It looks delicious. Thank you for sharing your recipe. That looks so good. Nothing like "real" mac-n-cheese. True comfort food. When I was a kid my mom worked. We always had macaroni and cheese on Thursday night. Always. I got to where I hated it. But after I got married, my wife made it with extra cheese and garlic, and peppers, and I really like that. We also keep a bunch of it in the supply room because it's quick and easy. In some situations, whether you like something or not is irrelevant. Most definitely! Different mac and cheese combos are a hit here with both young and old. Yours looks great, by the way. Never have been a fan of Mac and cheese.. Had it WAY too much when my sons were little... ha... BUT--some of the fancy recipes these days with added stuff are good!!!! I do like cheddar cheese --and don't care for Velveeta ---if I make mac and cheese. Yours looks good. That's the way I make it also, however mine doesn't look that good! The kids have always wanted me to make it whenever they're visiting. Love mac and cheese. YUUUUMMMY! My MIL makes the best in a crock pot. She doesn't have a recipe, just mixed some cream of cheese soup, a boxed mix, and real cheese and milk and who knows what! My dad used to make the very best . .
oooh, this looks mighty good. I like the addition of the tomato. It will add a nice fresh taste to the dish. Have you read my last poem, Lisa? I've been looking for a nice title. Please, take a look! Have a great week, sweetheart! I'm going to try this for dinner tomorrow. We love mac and cheese here. I adore Mac & Cheese. But would you believe it is not commonly made or eaten in Ireland. Each time I visit the USA I make sure to order a portion of Mac & cheese in any diners we visit!